Have you ever gone fishing when you just weren't really feeling it? After spotting and successfully stalking the nice brown trout, I began to think that my day had reached its climax early. My plan had been to head to a nearby river where I have hooked large fish before. In fact, the fish in this particular spot have taken me to school. The largest rainbow I've ever hooked was on this river. 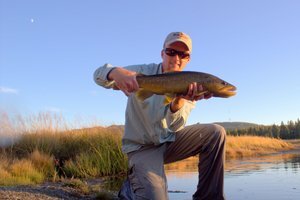 The fish threw the fly after peeling line in one continuous blistering run downstream until I was well into the backing. Those moments happen but rarely, at least when I'm trout fishing. This was supposed to be one of those redemption trips where you find and hook a nice fish and then don't lose it in the process of fighting it. I just wasn't feeling it though. Rigging up with a deep nymph system complete with midges and my favorite sow bug pattern brought a little confidence, but then the long times between even the most subtle of takes had me thinking increasingly about heading home. Knowing that the fish were there was kind of nice but not hooking them was not helping with the feeling that the day was winding down. Finally it was decision time. I'll just head on out. Then I noticed that the water had dropped a few inches and decided to try another few casts. You know, just one more. Of course, one became three, then four, and on cast four the indicator shot under. Forget those gentle takes, this was undoubtedly a fish. 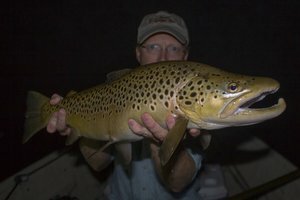 Pulling back, I realized that it was not just any fish but a decent trout, hopefully a brown. The golden flash moments later verified that last bit. The fish had succumbed to the sow bug pattern. Yes, I was happy now. My persistence had paid off. Again I contemplated leaving, but again I decided on a few more casts. Catching fish has a way of getting your mind back in the game. The next time the indicator shot under, the ponderous head shakes that followed suggested a larger specimen. The steady bulldogging convinced me that it was a brown. Up and down the river I followed as the fish pretty much went wherever it wanted. 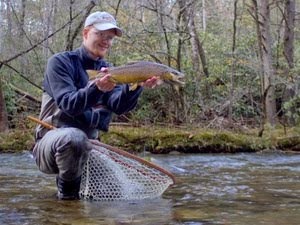 Slowly I gained line until finally I slipped the net under a beautiful male brown colored up like fall. 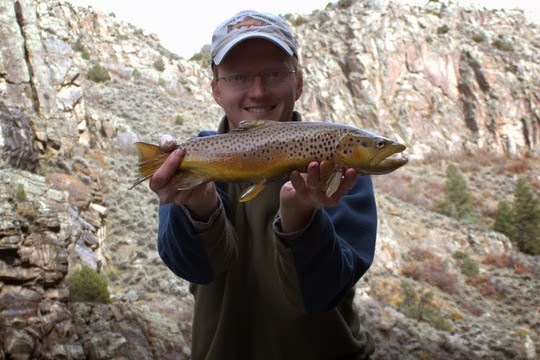 Likely the prettiest fish I'll catch this year, I took a moment to appreciate the reward I gained for my persistence. 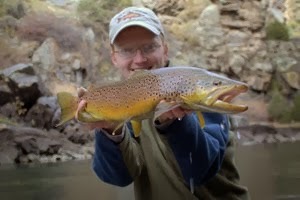 Gently holding the fish in calm water, I gave the big brown the opportunity to rest from its exertions. Only a moment was required before it shot back out into the current, but not without leaving behind a memory of the reward gained for persistence. Dude! Seriously nice fish. What a beauty. Congrats. Thanks Ben. I was definitely thrilled! Another great example of when persistence paid off! Hey, David, sometimes we have to wait until the fish "Feels it". Mel, you're right. Sometimes I wonder how many fish I miss out on because I'm not patient enough. Nice going David, beautiful fish. I think you've found an important key. Persistence does pay off. Thanks Juan. We need to get together again sometime! I'll probably be heading down that way to fish in Pueblo as the weather cools. Let me know if you want to get out sometime. 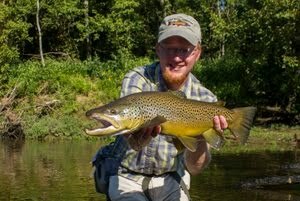 Nice brown! It is always the one more cast....Great post!